Shelby American actually “backward engineered” the street version of the ’65 GT350 from the competition model. What was really cool about the Competition model (often referred to as the “R” model) was that it was the only time, until 1993, that Ford had offered a full road-race car to the general buying public. Prior to that, the only type of race car that had been built was the Fairlane Thunderbolt. The Competition model had been developed to compete in Sports Car Club of America (SCCA) racing and held its own very well in the fray. There were 34 Competition models built and raced by the “public,” and two prototype cars were raced by the factory team. Below is a list of the special items on the Comp cars to give you an idea of how much Shelby did or didn’t tone down the street car. The Ford Mustang was an instant success in late 1964. Production for new Mustangs was slated for 559,451 cars in 1965. Lee Iococca had guessed right, new car buyers wanted a sporty midsize car. And allowing the buyer to order a Mustang any way you wanted was right on target. But the Ford wanted the Mustang to have a performance image. The Corvette reflected on Chevrolet’s entire line of cars. On the race track Ford powered Carroll Shelby’s Cobras battled GM’s Corvette for titles. The Cobra’s won more often than they lost but Cobra racing success didn’t do much to sell Ford cars. The Cobra was a very limited production car. Only 1,002 cars were built. And it was too expensive at $6,000 to be “everyman’s” kind of sports car. The Mustang on the other hand was already a popular, sporty car. If the Mustang could win against the Corvette, Ford would sell cars. Win races on Sunday, sell on Monday. Carroll Shelby and his team at Shelby American eagerly agreed to modify some Mustangs. Shelby recognized a good thing when he saw it. A wild, ultimate Mustang was a natural step. A special edition Mustang would be a commercial success. The plan was to modify some Mustangs and make them win on the track. Two Mustang Fastbacks were shipped to Shelby American for Ken Miles to sort out the suspension and power train. Pete Brock came up with the stripes and visual package. Shelby hired Chuck Cantwell, then a GM engineer, to lead the efforts. Two Coupes were also modified, probably at Ford. In order to race the limited production Mustangs SCCA rules required a minimum number of the cars be offered to the public. The rules also required the cars to be two seaters. Only designated Ford dealers would be able to offer Shelby Mustangs. For $5,995.00 a buyer could drive off with a fine tuned, full race car, a GT350R. For the first time a car manufacturer was offering a race-ready car to the public, a special-edition racing Mustang. The Shelby Mustang had to be qualified for the Sports Car Club of America (SCCA) B/Production class to race against the Corvettes. John Bishop from the SCCA specified the modifications needed to the make the fastback 2+2 GT Mustangs pass inspection. At least 100 examples had to be “series-produced with normal road touring equipment” as well. The cars had to be offered with only one change from the cars raced. Shelby’s team first built a street GT 350 with “normal” road equipment then constructed a competition version around it. Ford definitely didn’t want to warranty the 450 HP racing engines anyway. 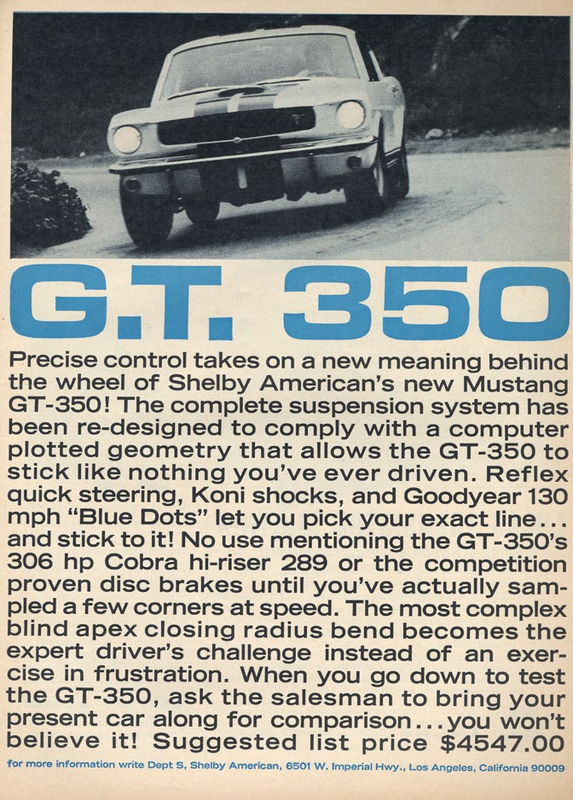 How did the car come to be named a GT 350? It’s been said that the 350 came from an discussion at Shelby American while trying to come up with a name for the Cobra-Mustang. Carroll Shelby is said to have asked how many feet it was from the office to the workshop buildings. Phil Remington told him it was 350 feet. So it was called a GT 350. The 350 was also 100 something larger than any GT Ferrari offered. Ford shipped 100 fastback Mustang GT’s to the Shelby American plant in Venice, California. The Mustangs were shipped as K-code DSO (District Special Option) meaning they were GT’s with special parts added. The cars all had standard interiors front seats, and dashes. A special export brace made from stamped steel was added under the hood running from the shock towers to the firewall to strengthen the front end. It was called an export brace because all the Mustangs exported had it. All the GT’s were ordered with Ford’s special 9″ Detroit Locker differential. This heavy duty, “no-spin,” limited-slip rear end was made by Detroit Automotive Products for use in trucks. Each GT came with a close ratio T-10 Borg Warner 4-speed transmission with an aluminum case to save weight over the much heavier, Ford 4-speed. Adjustable Koni shocks were installed all around. Special Goodyear Blue Dot hi-speed 130 MPH tires were mounted on white, 15 X 5 1/2 steel, station wagon rims. The tires were 7.75 X 15 and were rated at 130 MPH. The factory deleted the rear seats, the hoods, exhaust and grille bars. Once the Mustang GT’s got to Venice, they were stored out in the lot awaiting the Shelby touch. By October 1964 three prototype GT 350s were ready. All the rest of the Mustangs were painted the same Wimbledon white with blue racing stripes. When the SCCA inspectors arrived in December they saw the necessary 100 Shelby Mustangs. The ruse worked, the GT 350 was given the OK to race in B/Production class against the ‘Vettes. To have a chance at winning on the tracks, the Mustang had to be seriously modified. SCCA B/Production class required the cars be two seaters so the rear seat was replaced with a fiberglass deck for a spare tire mount. (This was to create an interesting problem for racing the fastbacks in other races since they were 2 seaters not passenger sedans. The Falcon dash didn’t have spare room for a tach and oil pressure gauge so a pod was mounted near the middle of the dash. The plastic steering wheel was replaced with a deep dish, wood rimmed wheel that had a Cobra snake emblem in the center. The horn button became a toggle switch on the dash. A Monte Carlo bar, first used on Ford Falcons raced at Monte Carlo, was put on each GT 350 to add even more strength to the front end and keep the shock towers from flexing. Quick release, 3″ wide, competition seat belts were installed to keep the driver in place. The brakes had to be modified for racing use. The Kelsey-Hayes front disc brakes were kept, but sintered metallic pads were used instead of the softer stock ones. On the rear, the drum brakes remained. But bigger, wider 10″ x 2.5″, metallic lined, shoes were added. It took a lot of foot pressure to stop a moving GT 350. A sticker was added to the dash explaining that the clunking noise from the rear end was normal during hard cornering. New idler and longer Pittman arms quickened the steering from 21:1 to 19:1. The lock to lock turns of the steering wheel was reduced from 3.75X to 3.5X but it took a lot more effort to turn the wheel, especially if the car wasn’t moving. An oil cooler was added to the differential. The small, Mustang radiator was replaced with a much bigger one from an air-conditioned Galaxy 500. During hard cornering the Mustang body had a tendency to lift a wheel off the pavement and to plow in to the turn. Lowering the body resulted in greater changes in the wheel camber during cornering, keeping the wheels vertical to the ground. It also lowered the front end’s roll center and reduced the body’s plowing. To further stiffen the front end, a 1.00 inch anti-roll bar replaced the stock .84 inch stock GT bar. The live, rear axle was held in place with a 4-leaf, semi-elliptical leaf spring and beefy torque reaction arms sitting on top of the axle and anchored through the floor to the chassis. These changes made the car handle more quickly and precisely. The only difference between the street GT 350’s suspension and the racing version was a stiffer adjustment on the Koni shocks. The battery was moved from under the hood to the trunk to redistribute some of the weight. (The battery was moved back under the hood after a third of the cars were built after owners complained about the fumes in the car and corrosion. Even with the much lighter fiberglass hood, the weight distribution of the GT 350 was 55% front to 45% rear, compared to 56%/44% on the stock Mustang. The GT 350 weighed in at 2790 lbs, about 150 lbs. lighter than a stock Mustang GT. The racing weight was 2550 lbs. Under the hood, the GT Mustangs came with Ford’s new, Hi-Po 289. This hi-revving small block V-8 put out an incredible 271 horse power from the factory. 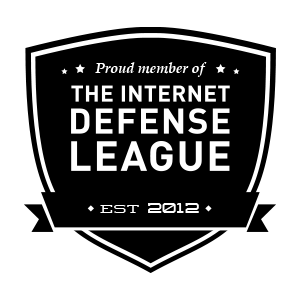 Shelby’s team took a good idea and made it better. At the Venice plant a new aluminum, Cobra hi-rise intake manifold replaced the heavier, stock, cast-iron manifold. center-pivot float 4-barrell carburetor sitting on top of it. The carb was designed not to starve or flood out during hard cornering. Light weight, tubular Tri-Y exhaust headers made for the GT 350 by Cyclone & Belanger fed straight-through pipes and low restriction, glass-pack mufflers. The pipes exited just ahead of the rear tires. The engine was dressed up with a chrome air cleaner, finned aluminum Cobra rocker covers and a deep sump, 7.5 quart, cast aluminum, finned, oil pan. The oil pan had built in baffles to hold oil close to the pickup during acceleration and cornering. Shelby advertised 306 Horse Power in his Mustangs. 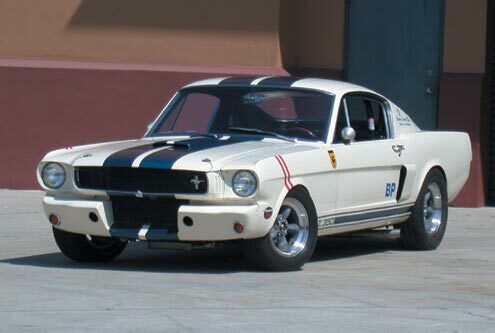 All the 1965 GT 350s were painted Wimbledon white with blue racing stripes running the length of the car. When you met a GT 350 on the street it could be one of the 36 racing GT 350Rs or a street version, they all looked alike. The fiberglass hood had pin-lock, hold downs and a built in hood scoop to feed air under the hood and to clear the Holley and air cleaner sitting on top on the hi-rise intake. The air intake on the front of the car was simplified by removing the stock front ’65 bars and adding a smaller running horse to the drivers side of the grille. For an extra $273 a buyer could replace the white 15″ rims with cast magnesium rims. The GT 350 was not a car for the feint of heart. It was a true muscle car. This car had to be driven. The quicker steering took a lot of effort but no more then trying to stop it with the stiff brakes. It demanded the driver’s attention. There wasn’t anything subtle about a GT 350. Give the accelerator a quick touch with your right foot, the engine would quickly rev up then settle back down to 800 RPM. The exhaust pipes, exiting behind the doors, filled the cockpit with a roar. Heads turned on the street. There was no mistaking a GT 350. Definitely something that legends come from.